I concur with my colleague Jamie Winterton that “cyber” has become overdetermined and if you’re into understanding how that works you should check out her upcoming event with the Center for Science and Imagination. 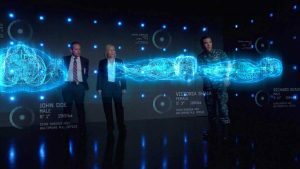 “Cyber” simultaneously looks to be urgently everywhere while also remaining mystifying for many beyond whatever pleasure there may be in police procedurals. Additionally, while poking fun at a certain someone’s invocation of “the cybers” is an important way of addressing the mind-bending lack of information/awareness at many levels of American society, there are also real risks. We have been and continue to be in an historical moment in which the need to understand digital security and risk is urgent for not just nation-states, but for individuals and collectives as well. As too many of our colleagues (both in and outside of academia) know, “security” is often leveraged as a tool to protect the state at the expense of its most marginalized people, or by dominant groups against dissenters and critics. And many of these same colleagues have been at the forefront of innovative work both problematizing traditional cyber and other security discourses and finding ways to support and keep one another safe (thinking here of work by Simone Browne, micha cárdenas, the Digital Alchemists, Electronic Disturbance Theater, Tactical Technology Collective, Take Back the Tech, Crash Over Ride Network and the Electronic Frontier Foundation, among others). In order to explore the ways in which digital humanities and cybersecurity domains might fruitfully and ethically overlap, HS Collab and Nexus Lab are hosting a small group of people together to have an initial discussion on February 9. This event builds on work that Quinn DuPont and Bradley Fidler and I have each been doing elsewhere. We recognize the dangers of becoming part of a military-industrial-academic complex that privileges the security of just a few and creates precarity for many. Rather than simply reproduce problematic frameworks and methods (or even tools), we’ll be spending the day thinking about how we can learn from decolonial and indigenous approaches to cybersecurity. We’ll be learning more about long histories of both “cyber” and ideas of security/privacy/encryption. We’ll think about the ontologies at work in cybersecurity work and how they might be imagined otherwise. We’ll report out and we’ve got a larger, open event in the works as well. If you happen to be in the Phoenix metro area and interested in these topics, Brad and Quinn will also be talking at an open lunch event in the Nexus Lab on the ASU Tempe campus on Feb 10th (more info shortly).